Tropical Storm Bertha is moving more westward than originally forecast and gradually strengthening. Maximum sustained winds are now 50 mph, and little change in strength is expected today, but it is forecast to become a minimal hurricane as it moves north of the Lesser Antilles in a few days. 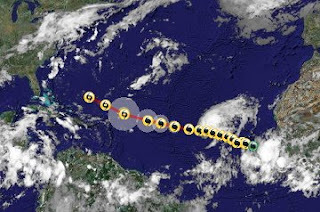 Tropical Storm Bertha track from IBISEYE. How's that for a dramatic headline? The facts are somewhat less apocalyptic, but impressive anyway. Jeff Masters' Wunderblog notes that Bertha, which formed this morning near the Cape Verde islands at longitude 25W, is the first tropical storm in history to have developed so far east this early in the season. In fact, it's the easternmost storm to have formed in the entire month of July. 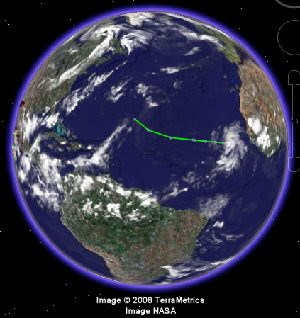 Complete records covering the eastern Atlantic go only as far back as 1967 with the beginning of satellite coverage, however. Bertha is currently a minimal tropical storm with maximum winds of 40 mph. Gradual strenthening is expected as it moves toward the west northwest during the next couple of days. Here's where we put the "capital" in CapitalClimate. Energy prices have been soaring well enough on their own lately (past $140 a barrel for oil), but what if tropical storm disruptions or an exceptionally cold winter put more upward pressure on prices? Despite all the complaining over heat and humidity around this time of year in the Nation's Capital region, the typical household in the area spends more on heating than cooling. The Big Boys can hedge by trading in the futures markets, but the prices there are heavily influenced by speculation. For natural gas, Zweig recommends the United States Natural Gas Fund (ticker symbol UNG), which began trading in 2007. A more recent market entrant is the U.S. Heating Oil Fund (UHN), which was launched a few months ago. Also launched recently is another hedge against growing household energy costs, the U.S. Gasoline Fund (UGA). Expenses involved in this strategy include management fees of about 0.6-0.8% and commissions to buy and sell (now around $10 or less per transaction at many discount brokers). In the event of a gain, profits are subject to taxes at ordinary income rates for shares held less than a year and capital gains rates of 15% or less for longer holding periods. If the value goes down, you can use the money saved on your heating bill to hedge against future price increases. If you sell the shares at a loss, then the loss amount can offset gains from other investments or be deducted from other income up to $3000. Image: 3-month chart of UNG from BigCharts.com, via Fidelity Investments. Click to enlarge. Tonight's Daily Show is a rerun of the June 18 episode, including the report, "There Will be Flood: The media attempts to show the Midwest flood's magnitude by breaking out the human dipsticks." The show will be repeated during the day on Tuesday. Also included is "Wet Hot American Bummer", in which Jason Jones and Wyatt Cenac "report" from Quincy, Illinois. Gristmill has an extensive interview today with former EPA associate deputy administrator Jason Burnett. The former official resigned over White House interference with EPA's draft response to the Supreme Court's ruling requiring regulation of CO2 emissions. Meanwhile, Climate Progress reports that a Georgia judge has applied the Supreme Court ruling for the first time to prevent construction of a coal-fired power plant. CBS News Political Animal blog: Creating Their Own Reality "College freshmen around the world are rejoicing that one of their favorite excuses for avoiding class assignments now has official sanction." For the You-Tubers, Jon Stewart presents the case below.